Doesn’t everything taste better when it’s grilled? Well, OK maybe not comfort foods like chicken pot pie or risotto, but hey, its summer, so who needs comfort food? I find the sun and warm weather pretty darn comforting. I grill A LOT in the summer, and I don’t mean to be a Debbie downer about grilling and meat, but there is some concern about grilled meats and cancer. Be careful when grilling meat to make sure that you don’t char it – which causes HCAs or hererocyclic amines to form. There is research, which suggests that HCAs are linked to cancer, but happily for all grill lovers, HCAs are considerably reduced when meat (and chicken or fish) is marinated. Just a quick dunk in any kind of marinade does the trick. Vegetables, however, do not form HCAs, no matter how much you like to char them. So feel free to skewer them up, and grill away. 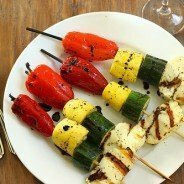 I love these “Stoplight” veggies combined with some salty Halloumi cheese – which just happens to be perfect for grilling. If you’re not familiar with Halloumi, it’s a favorite in Cyprus, Greece and Turkey, and it’s mild flavored, a little bit salty-briny, and squeaks when you chew it. It has a high melting point, so it holds its shape when baked or grilled, and grilled Halloumi is absolutely delicious! I toss the vegetables with olive oil, salt, pepper and some Italian seasoning before grilling. Be careful to not salt the cheese, which is already perfectly salted on its own. A drizzle of balsamic syrup adds a nice flavor after they’re grilled. Leave the red peppers whole. Cut the zucchini and summer squash each into 6 even pieces. Drain and liquid from the cheese and cut it into 6 evenly sized slabs. Toss vegetables with olive oil, salt, pepper and herbs in a large bowl. 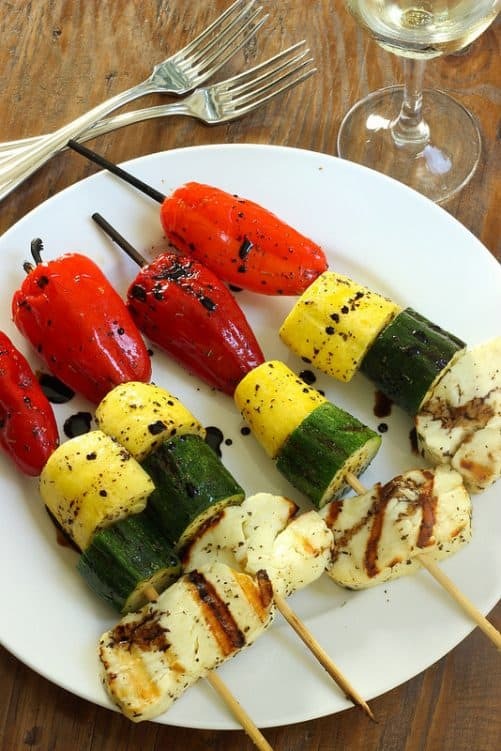 Skewer one of each vegetable and a piece of cheese onto 6 skewers. Grill until vegetables and cheese are all slightly charred. Optional: bring balsamic vinegar to a boil, reduce heat to medium high and cook until vinegar is thickened to a syrup consistency. Drizzle over cooked vegetables and cheese.